The Physics Air group offers two kinds of displacement models to push along the particles. The one discussed here is Turbulence Field. Turbulence is not based on fluid dynamics. Instead, it is a 4D displacement based on Perlin Noise Fractal Theory. Turbulence adds motion so the particles that are close to each other get a similar, but not equal, random motion. This behavior helps tremendously when creating fire and smoke effects to make particle motion look natural. Unlike fluid dynamics, Turbulence computes fast and can be freely scrubbed back and forth in the Timeline. If you want to know about the inner workings of Turbulence Field, go to the end of this page to read about Perlin Fractal Noise. The full Turbulence Field group. Affect Size enables using the fractal for particle size distortion. Setting up this parameter means the fractal field will be sampled at each particle's location, and the size of that particle will be affected by the value of the field. This can be useful for creating cloud-like particle clusters. Affect Position uses the fractal to displace particle position. This is useful for creating natural looking motion for fire and smoke effects. Notice how different it is from Spin. Fade-in Time sets the amount of time before the particles are fully affected by the Turbulence Field. Measured in seconds. High values means the Turbulence takes awhile to affect the particles, which makes the animation fades in gradually over time. 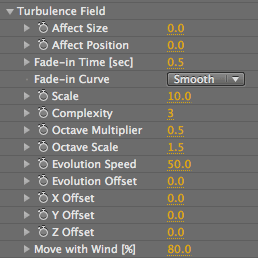 This is a fade-in curve control for Turbulence Field. Trapcode Particular's standard method of Linear fade-in sometimes produces a jerk in the animation. This Linear method is still present as the default option. The new Smooth method fades in the field more subtly. Scale sets the overall scale of the fractal. See animations above for Affect Position. Complexity is the number of Perlin noise fields added together to form the fractal. Octave Multiplier sets the influence of each added noise field as compared to the previous field. 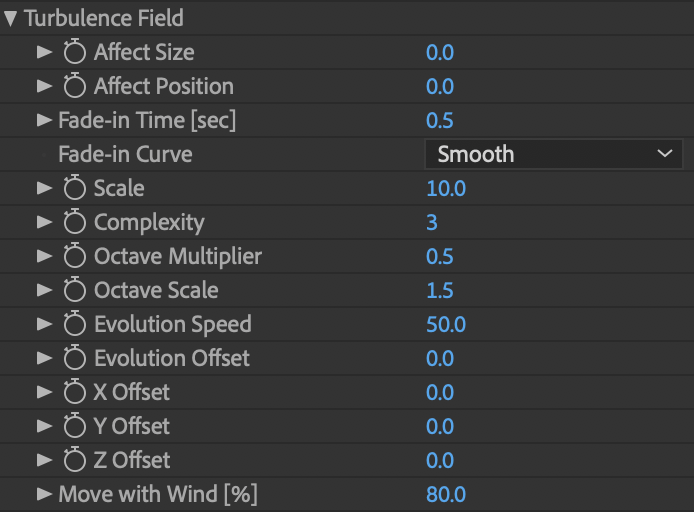 Octave Scale sets the scale of each added noise field compared to the previous. Evolution Speed sets how fast the Turbulence Field evolves over time. Evolution Offset is kind of like a random seed. It offsets the 4D Turbulence Field in the 4th dimension, which is time. Evolution Offset gives more control over how the Turbulence Field can be moved. These three controls offset the entire Turbulence Field in each axis. This also gives more control over how the Turbulence Field can be moved. Move with Wind gives the ability to move the Turbulence Field with the Wind. It ties the Turbulence Field into the Wind X, Y, Z controls in the Air group. Measured as a percentage of the Wind value. At 100%, the Turbulence Field follows the Wind exactly. At 50%, it still follows the Wind's direction, but only 50% of the distance. This control gives a very realistic look to fire and smoke effects. It is useful for getting a natural look in making wind, since the Turbulence Field moves with the wind as it would in real life. In order to fully comprehend the Turbulence functionality, some Perlin Noise fractal theory helps. Perlin Noise was invented by Ken Perlin. (Kudos to Mr. Perlin, this is amazing stuff!) Perlin Noise is a quick way to produce a pseudo-random field that can be of any dimensionality (1D, 2D, 3D, etc). The number of fields added together is called Complexity. For example, if three fields are added together, complexity equals three. The difference in scale for each field is called Octave Scale and the difference in influence for each field is called Octave Multiplier. The images above were created using Adobe After Effects' built-in Perlin Noise fractal generator (Effect>Noise>Fractal Noise). The really interesting part of Perlin Noise that these fractals can be evolved over time. What is seen in the images above is actually a cross section of a 3D Perlin Noise fractal. The cross section can slide through 3D space and thus create a smoothly evolving 2D pattern. This parameter is called Evolution. In Trapcode Particular, a 3D displacement field is needed. This requires the Perlin Noise fractal to be 4D so it can smoothly evolve by sliding the 3D cross-section in 4D space. And now you've been initiated into Fractal Noise Theory!